Prof. Mark Wilde has been named an LSU Rainmaker. Paper by Prof. Jorge Pullin highlighted in CQG+. Paper by Prof. Jorge Pullin featured in Quanta Magazine. Prof. Ivan Agullo receives essay first prize from the Gravity Research Foundation for the second time. The competition, in its58th year has seen only six people winning twice. Prof. Ivan Agullo's paper featured in phys.org, Science Alert and Cienciaplus. Prof. Jorge Pullin has co-edited with Abhay Ashtekar, the Eberly Chair of Physics at the Pennsylvania State University, the volume "Loop quantum gravity: the first 30 years". It includes eight chapters by young emerging leaders of the field providing a snapshot of its state of the art, including one by LSU's Ivan Agullo and Parampreet Singh. The book is part of the series that World Scientific Publishing Co. of Singapore is putting out to celebrate the 100 years of Einstein's General Theory of Relativity. According to the publisher, It will include "two dozen excellent monographs written by top-notch authors from the international gravitational community". Prof. Jorge Pullin's paper made one of the highlights list for the 2014-2015 year by the journal Classical and Quantum Gravity. Physical Review X, the journal of which Jorge Pullin is the founding editor becomes the first journal of the American Physical Society to have an impact factor higher than according to Thomson Reuters it is 9.05 for this year. Prof. Jorge Pullin gave a public lecture and a departmental colloquium at the Universidad Michoacana in Morelia, Mexico as part of their celebrations for the 100th anniversary of Einstein's general theory of relativity. The book "A first course in loop quantum gravity" by Rodolfo Gambini and Jorge Pullin has now been published in Japanese. Physical Review X, the new open access journal of the American Physical Society of which Jorge Pullin is the founding editor, has been assigned is 2014 impact factor by Thomson Reuters. It is 8.38, the first time an original research journal of the American Physical Society has been above 8. 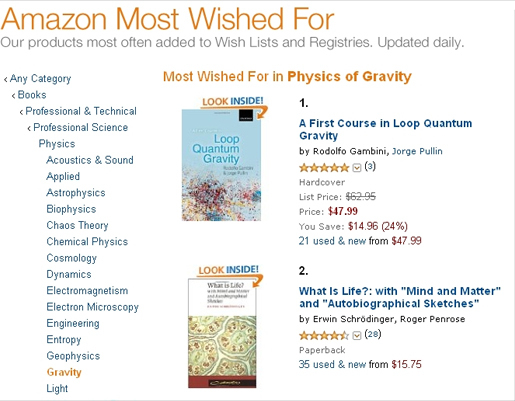 It is now the second most impactful original research journal in the world covering all of physics. Renowned Cambridge philosopher Jeremy Butterfield evaluates the Montevideo Interpretation of quantum mechanics. Work by Rodolfo Gambini and Jorge Pullin has been featured in Sabah, Slate.fr, and Instantanes Techniques. Research by Prof. Jorge Pullin is featured in Research.gov. Assistant Professor of Physics, Parampreet Singh has been awarded the Vainu Bappu gold medal of the Astronomical Society of India. Previous winners include the 2011 Nobel Prize winner Brian Schmidt and renowed Cambridge and Caltech professors George Efstathiou and Sri Kulkarni. LSU researchers awarded nearly $1 million for big data research -- LSU's Seung-Jong Park, associate professor of computer science with joint appointment in the Center for Computation & Technology, or CCT, along with co-investigators Joel Tohline, Sean Robbins, Lonnie Leger, K. Gus Kousoulas and other senior LSU faculty, recently received an NSF grant of $947,860 for a campus-wide project aimed at bringing "Big Data" computational capabilities to separate university research groups. Samsung Electronics is also participating in the project as an industrial collaborator. The project, titled "CC-NIE Integration: Bridging, Transferring and Analyzing Big Data over 10Gbps Campus-Wide Software Defined Networks," will empower scientific breakthroughs at LSU by providing researchers with advanced information technologies and cyberinfrastructure. New Assistant Professor in the LSU Department of Physics and Astronomy, Iván Agulló, was interviewed about his work during his recent stay at Cambridge University in the United Kingdom. Physical Review X, the new open access journal of the American Physical Society of which Jorge Pullin is the founding editor, has been assigned an impact factor by Thomson Reuters. It is 6.711, which is the highest for any open access journal in physics. Jorge Pullin has been interviewed for the FQXi podcast. FQXI - Foundation Questions Institute, "Exploring Foundations and Boundaries of Physics and Cosmology". FQXi catalyzes, supports, and disseminates research on questions at the foundations of physics and cosmology, particularly new frontiers and innovative ideas integral to a deep understanding of reality, but unlikely to be supported by conventional funding sources. An article by Rodolfo Gambini and Jorge Pullin showing that quantum gravity eliminates the singularity inside black holes. The work has been highlighted in New Scientist, HypeScience, Indian Express, zeenews.com,Mother Nature Network, Business Standard, International Business Times Italia, The Asian Age, TopNews New Zealand, Live Science, Physics Central, RealClearScience,Inside Science, The Free Press, Mother Nature Network,physics.aps.org, phys.org, NBC News, Laboratoryequipment, CCT and another on the CCT website, and many other outlets. Jorge Pullin has been appointed to the committee that will select the winner of the Young Scientist Prize of the International Society on General Relativity and Gravitation. Research paper by Parampreet Singh has made the Highlights 2011-2012 list of the journal of Classical and Quantum Gravity. The LSU Gravity Group has made the Highlights list every since 2001. Parampreet Singh has been chosen as one of the Great Baton Rouge Business Report.com's 2012 Forty Under 40. LSU Researchers Win $250,000 Grant to Probe Origins of the Universe - Parampreet Singh, assistant professor in the LSU Department of Physics & Astronomy, and Peter Diener, assistant research professor in the LSU Center for Computation & Technology and the LSU Department of Physics & Astronomy, recently received a $250,000 grant for a potentially breakthrough proposal hoping to answer questions about the earliest state of the universe. The grant, funded by the John Templeton Foundation sponsored the New Frontiers in Astronomy & Cosmology International Grant Competition, awarded more than $4 million in research grants to 20 scientists worldwide. LSU CCT Receives Top Paper Award by HPDC (High Performance Parallel and Distributed Computing), the premier computer science conference for presenting new research. Physics and Astronomy Adjunct Faculty, Gabrielle Allen is a co-author of the research paper. Jorge Pullin gave an invited Departmental Colloquium on Friday, April 13th and a Public Lecture on Thursday, April 12 at the University of North Carolina-Wilmington. Jorge Pullin has been appointed to the Advisory Panel of the Journal of Classical and Quantum Gravity of The Institute of Physics (UK). Professor Publishes First Undergraduate Loop Quantum Gravity Text - Jorge Pullin and Prof. Rodolfo Gambini of the University of the Republic, recently published a first of its kind textbook with the Oxford University Press - Titled “A First Course in Loop Quantum Gravity” . Mette Gaarde is the recipient of the Tiger Athletic Foundation Undergraduate Teaching Award. Jorge Pullin has been named a Founding Editor of Physical Review X, the new, open access, all-electronic journal in the Physics Review series, set to cover all areas of physics and begin publishing in September 2011. As founding editor, Pullin will have to set up the initial editorial board, recruit the initial batch of articles, and promote the journal at physics meetings worldwide. As part of a program to develop a model of quantum cosmology, Kristina Giesel and colleagues from the University of Warsaw have proposed a new theory to describe the evolution of space-time in the very early Universe. Their paper (in Phys. Rev. D 82, 104038) describes their approach to couple the gravitational field to a scalar field using loop quantum gravity techniques to complete the quantization. Their work is also featured in Science Daily. A paper by Kristina Giesel has been listed among the "highlights" of the Editorial Board of Classical and Quantum Gravity, published by the Institute of Physics in the UK. The LSU gravity group has made the highlights list every year since 2001. Jorge Pullin has been appointed editor for the space-time and gravity section of Scholarpedia. Scholarpedia is a wiki based encyclopedia using the same software as wikipedia, but with articles written by experts and peer reviewed. Parampreet Singh has been distinguished with the 2010 S. Chandrasekhar Award of the International Society on General Relativity in Gravitation. The award is given to the best presentation by a postdoctoral researcher in the triannual meeting of the society, the last meeting was held in Mexico City, Mexico in July, 2010. The award consists of a free three year membership to the society and a check for $150. The Editorial Office in Singapore has appointed Parampreet Singh as Editor of the International Journal of Modern Physics D. This is the leading journal in gravitational physics in Asia, published by World Scientific Publishing Company in Singapore. Jorge Pullin was invited by the Topical Group on Gravitation of the American Physical Society to present a talk at the Principal Investigator Symposium on Gravity at the National Science Foundation (NSF). The symposium is to convey the excitement of recent developments in gravitational physics to the authorities of the Foundation and features four principal investigators of NSF grants in gravitational physics. Carlos Palenzuela, Luis Lehner, and Steven Liebling have described a mechanism for producing the highly collimated relativistic jets observed in black hole systems (Science 329, 927, 2010; Science 329, 908, 2010). Based on numerical simulations of the coalescence of two supermassive black holes during a galaxy merger, they describe a scenario in which a characteristic electron synchrotron signal is produced in association with a gravitational radiation event, and predict that the combined electromagnetic-gravitational wave signature might be observable out to a redshift of z ~ 1. Work by the LSU Physics & Astronomy Numerical Relativity Group is featured in HPC Wire. LSU Professor, Hearne Chair of Theoretical Physics and Interim Co-Director for the Center for Computation and Technology Jorge Pullin has been invited to attend a joint commission meeting on science and technology cooperation between the United States and Argentina in Buenos Aires, Argentina, in September. The meeting is organized by the United States Science & Technology Cooperation and the Ministry of Science and Technology in Argentina and will be attended by representatives of many U.S. agencies that fund science and technology projects, as well as their counterparts in Argentina. Pullin was asked to attend the meeting because of his previous experience in cooperation with Argentina and his expertise in the area. Jorge Pullin has been appointed to the Advisory Panel of the journal Classical and Quantum Gravity of the Institute of Physics (UK). The advisory panel is composed of 20 high caliber researchers from around the world and will provide advice to the journal on fast track communications and other high priority research papers in order for the journal to apply the highest possible quality standards. A recent article in Nature Physics documents the transfer of frequency comb production from the optical region to the vacuum ultraviolet region for the first time. In collaboration with experimental colleagues at JILA in Boulder, the ultrafast AMO theory group at LSU (Gaarde, Hostetter, Schafer, Tate) demonstrates how the technique of high harmonic generation can preserve the temporal coherence necessary to generate a frequency comb structure in the 7th harmonic (153 nm) of an intense infrared laser pulse. This work unites high precision spectroscopy, a specialty of the JILA group, with strong field physics, which has been extensively studied at LSU. The National Science Foundation has awarded a grant of $1,400,000 to Louisiana State University & Agricultural and Mechanical College for support of the project "PetaCactus: Unraveling the Supernova -- Gamma-Ray Burst Mystery" under the direction of Erik Schnetter, Adam Burrows, Christian D. Ott, and Gabrielle D. Allen. The journal Classical and Quantum Gravity highlights a community paper called "Testing Gravitational-Wave Searches with Numerical Relativity Waveforms: Results from the First Numerical Injection Analysis (NINJA) Project" with authors from many institutions, including several current and former members of LSU's Relativity Group. A team led by Adjunct Professor Gabrielle Allen has won the IEEE SCALE 09 (International Scalable Computing Challenge) competition in Shanghai. The team's application involved a scalable end-to-end interactive system for the simulation and visualization of black holes that depended on the 10Gbps LONI network and machines. The team, a collaboration involving CCT, Computer Science and Electrical and Computer Engineering, included Physics and Astronomy Research Assistant Professors Erik Schnetter and Peter Diener and graduate student Oleg Korobkin. Article in the Baton Rouge newspaper, The Advocate, can be found here. More information can be found here. Jorge Pullin was appointed to the Editorial Board of Progress in Physics. The essay by Rodolfo Gambini and Jorge Pullin on the problem of time was awarded "second community prize" in the competition held by the Foundational Questions Institute - list of winners. Jorge Pullin was the only plenary speaker at the Atlantic General Relativity meeting in Fredericton, New Brunswick, Canada. CHICAGO - Edward Seidel, a globally recognized physicist and the leader of the National Science Foundation's Office of Cyberinfrastructure; Paul Avery, a recognized leader in advanced grid and networking for science; and Thomas Cheatham, a professor well known for his work in biomolecular simulations, will deliver keynote speeches at the TeraGrid'09, the fourth annual National Science Foundation (NSF) TeraGrid conference, June 22-25 in Arlington, Virginia. LSU appears on the CBS TV show "The Big Bang Theory"! This undoubtedly a first for LSU! Slightly after the 2:20 mark, a couple can be seen arguing the merits of loop quantum gravity vs string theory. The lady cites two achievements of loop quantum gravity, the calculation of black hole entropy and "minute differences in the speed of light for different colors." The second item refers to a paper by Pullin and Gambini. Jorge Pullin has been named to the General Council of the American Physical Society (APS). Read the details of his appointment at this link. Interim co-directors picked for LSU research center: Jorge Pullin has been named interim co-director, with Steven Beck of the School of Music, of the Center for Computation and Technology (CCT). Beck and Pullin will jointly lead the center while LSU starts an international search to replace Ed Seidel, who recently accepted a job as the National Science Foundation’s cyber-infrastructure director. Futher details can be found here. Joel Tohline receives honor from world's largest general scientific society. He has been awarded the distinction of being named Fellow of the American Association for the Advancement of Science (AAAS). Edward Seidel has been elected as fellow of the American Physical Society by the Division of Computational Physics (DCOMP). Luis Lehner has been elected to the "40 under 40" by the Baton Rouge Business Report. Gabriela Gonzalez has been named a Fellow of the American Physical Society in recognition of "her experimental contributions to the field of gravitational wave detection, her leadership in the analysis of LIGO data for gravitational wave signals, and for her skill in communicating the excitement of physics to students and the public." Joel Tohline has been invited to serve a 3-year term on the National Science Foundation's Directorate of Math & Physical Sciences Advisory Committee (MPSAC). The MPSAC is the only official advisory body to the Divisions within the Math and Physical Sciences Directorate, and the Directorate relies on the AC for both high level advice and connection to the community. More information on the MPSAC can be found here. Luis Lehner has been appointed to the Selection Committee of the Nicholas Metropolis Prize of the American Physical Society. The prize is awarded every year for the best dissertation in computational physics. Lehner was the first recipient of the prize in 1999. The conference Profs. Rodolfo Gambini (University of the Republic, Uruguay) and Jorge Pullin are organizing in Uruguay in October has been decleared "of national interest" by the government in Uruguay. Signatures at the bottom of the document are those of the Secretary of State, the Secretary of Education, and the President of the Republic. Luis Lehner will be one of the participants in the invitation-only workshop "Enabling Science Discoveries through Visual Exploration", organized by the National Science Foundation in Washington, D.C. on September 27-28, 2007. (http://www.iop.org/EJ/journal/-page=extra.high0607/0264-9381). Papers published by members of the LSU Relativity Group have made the highlights list for the last six years. Former LSU Physics undergraduate, Barrett Deris has received an NSF Graduate Fellowship. Deris is currently a graduate student at Univ. of California-San Diego. LSU Physics & Astronomy graduate student, Enrique Pazos, won the prize for the best graduate student presentation at the 3rd Gulf Coast Gravity Conference held at University of Alabama-Huntsville. The SPIRES bibliographical service at Stanford University has compiled a list of the most cited articles of all time to appear in the GR-QC preprint repository. This repository contains almost all papers in gravitation starting in 1992. Our paper with Dr. Rodolfo Gambini, "Nonstandard Optics in Quantum Space-time", cited 240 times, is the 21st most cited paper ever in the repository. Jorge Pullin has been elected corresponding member of the National Academy of Science of Argentina. Gerard Milburn, Adjunct Professor of Physics at LSU was elected a Fellow of the American Physical Society (APS). The American Institute of Physics (AIP) and the IEEE-Computer Society have appointed Professor Joel Tohline as an editor of the Visualizations department for their technical magazine Computing in Science and Engineering. The constituent readerships that CiSE serves include scientists and engineers from many disciplines as well as applied mathematicians and computer professionals, whose collaboration drives the cutting edge of computational science and education. Professor Jorge Pullin was elected as a Fellow of the American Association for the Advancement of Science (AAAS). Professor Jorge Pullin has been elected as a Corresponding Member of the Mexican Academy of Sciences. Prof. Ed Seidel of the Computer Science Department and the Department of Physics and CCT has recently won the 2006 Sidney Fernbach Award. Established in 1992 in memory of Sidney Fernbach, one of the pioneers in the development and application of high performance computers for the solution of large computational problems. The paper "Multi-block simulations in general relativity: high-order discretizations, numerical stability and applications" by Luis Lehner, Manuel Tiglio, and Oscar Reula was highlighted by the editorial board of the journal "Classical and Quantum Gravity". Jorge Pullin has been appointed to the Basilis Xanthopoulos Prize selection committee. This prestigious international prize is awarded every three years to a physicist under the age of 40 for contributions in gravitational physics. It consists of $10,000 and the opportunity to give a plenary lecture at the International meeting on General Relativity and Gravitation. The prize is funded by the Greek Foundation for Science and Technology (FORTH). Physics faculty involved in $1M National Science Foundation (NSF) Computer Science initiative at LSU. Rodolfo Gambini and Jorge Pullin are among the first awardees of grants from the Foundational Questions in Physics and Cosmology Institute (FQXi). Luis Lehner guest edited a special issue of the journal Classical and Quantum Gravity (Institute of Physics, UK), collecting the paper of the program on numerical relativity at the Banff International Research Station. Matthew Anderson is featured in this month's Diffpack Newsletter. Luis Lehner has been appointed to the NSF Cyberinfrastructure User Advisory Committee. Taken from his invitation to join this new committee, "Your nationally renowned research expertise and experience with cyberinfrastructure make you an ideal choice as on of the intial members of this new advisory committeel. You will be among one of the inital twelve members asked to serve on this CUAC." "Boundary Conditions for Einstein's Field Equations: Mathematical and Numerical Analysis", by Olivier Sarbach and Manuel Tiglio, published in The Journal of Hyperbolic Differential Equations 2,839-883 (2005), has been chosen as featured article of the Journal. The Louisiana Board of Regents gave their final approval to the creation of the Horace Hearne, Jr. Institute of Theoretical Physics. Jorge Pullin has been appointed Managing Editor of the International Journal of Modern Physics D. This is a peer reviewed journal published by World Scientific in Singapore and is the leading journal in gravitation and cosmology published in Asia. Asst. Professor, Hwang Lee has been awarded as Principal Investigator of a $400K one year grant from the prestigious National Reconnaissance Office (NRO) Directors Innovation Initiative (DII) program for a seed research project entitled "Photonic-Crystal Satellite Reflectors and Radiators: A New Approach to Satellite Thermal Control." Visiting Professor, Rodolfo Gambini, has been elected to the Academy of Sciences of the Third World (Trieste). Jonathan Dowling was elected a Fellow of the Optical Society of America (OSA) by the OSA Board of Directors at it's October 18th meeting. He is being recognized for "fundamental contributions to optics in the areas of photonic crystals, quantum imaging, quantum metrology, and quantum information processing, and for service to OSA." Dowling will receive the award at the Quantum Electronics and Laser Science Conference in May of 2006. Carlos Palenzuela, Postdoctoral Researcher in Physics & Astronomy at LSU and the Center for Computation & Technology, celebrated the publication of his first book, "Elements of Numerical Relativity: From Einstein's Equations to Black Hole Simulations." Jorge Pullin has been elected as a corresponding member of the Latin American Academy of Sciences. The Academy has 205 members from Argentina, Brazil, Colombia, Costa Rica, Chile, Ecuador, France, Germany, Guatemala, Honduras, Mexico, Panama, Peru, Uruguay, USA and Venezuela. Research paper by M. Tiglio, L. Lehner, and O. Reula, highlighted in Classical and Quantum Gravity journal (PAPERS 5819). Dr. Jonathan P. Dowling has been awarded a NASA Tech Brief Award for NTR no 40552: "High Power Fiber Laser Technology Using Linear and Nonlinear Photonic Bandgap Materials" by the NASA Inventions and Contributions Board. Jorge Pullin and Rodolfo Gambini receive 2005 Essay Award from the Gravity Research Foundation - "Classical and Quantum General Relativity: A New Paradigm", Rodolfo Gambini, Instit. de Fisica, Montevideo, Uruguay and Jorge Pullin, LSU Physics & Astronomy. LSU researcher, Mette B. Gaarde, wins award, grant from National Science Foundation for work on ultra-fast pulses of light and physics education. Rodolfo Gambini, Associate Faculty of the Hearne Lab, was elected Corresponding Member of the National Academy of Exact and Natural Sciences of Argentina. The Kavli Institute is the largest theoretical physics institute funded by the NSF. General purpose of the Institute is to contribute to the progress of theoretical physics, especially in areas overlapping the traditional subfields, in ways which are not easily realized in existing institutions. The institute's Director is David Gross, which is this year's Nobel Prize in Physics. Institute of Physics - At their May 2004 annual meeting, the Editorial Board of Classical and Quantum Gravity nominated their personal highlights in the journal over the past year. Three papers by the LSU Relativity Group were selected for the 2003 and 2004 Highlights. Articles are selected for many reasons - some contain outstanding research and breakthroughs while others are valuable reivews of the field. Some have an especially clear exposition and are beautifully presented; others are instructive, containing results and tools useful to many readers. This is the senior class of membership and indicates a very high level of achievement in physics and an outstanding contribution to the profession. Fellows of the Institute can use the designatory letters FInstP after their names. Dr. Luis Lehner has been selected for the Phi Kappa Phi Non-Tenured Faculty Award in Natural and Physical Sciences. Dr. Ed Seidel, head of Louisiana State University's center for Computation and Technology in Baton Rouge, is world-renowned for his research on black holes. Ed also maintains a part-time appointment as a professor at the Max Planck Institute for Gravitational Physics, or the Albert Einstein Institute, in Berlin. Seidel's research is in astrophysics and numerical relativity. an online journal that publishes review articles that are periodically updated by their authors. A collaboration between LSU, Brigham Young University and Long Island University has recently been awarded a four-year $2 million dollar grant. The research lead by Luis Lehner and Joel Tohline (LSU), Erich Hirschmann (BYU) and Steve Liebling (LIU) will concentrate on advancing information technology (development of adaptive mesh refinement techniques and their use in massive parallel computers like "SuperMike") and investigate astrophysically oriented problems involving strong/highly dynamical gravitational fields (black hole accretion systems). The research activities will combine expertise in applied mathematics, numerical relativiy, computational science and astrophysics. Copyright © 2006. All rights reserved. Official Web Page of the LSU Department of Physics & Astronomy.